In Your Face: That's Where This Jump Rope Displays Its Skip Count | OhGizmo! By David Ponce on 03/08/16 • Leave a comment! Eh, who cares about all this intro? 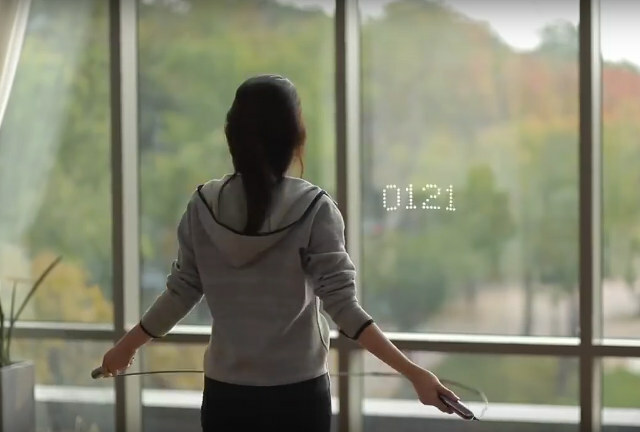 Look, the Smart Rope uses sensors and 23 LEDs to display your count in mid-air, right in front of you, as you skip. Ok? That’s the gimmick here. It uses a process called Persistence of Vision, and in addition of displaying your skip count, it can show you other data like calories burned or time elapsed. It’s a “smart” rope because it connects to your smartphone to give you additional options, like sharing and storing the data you generate while you bounce around. It’s $89.